Craig Reid and Charles Reid were born in Leith on 5 March 1962, and grew up in Edinburgh, Cornwall and Auchtermuchty. When they lived in Auchtermuchty they attended Bell Baxter High School. After several punk rock bands at school they formed the Proclaimers in 1983. The pair came to public attention when an Inverness-based fan sent their demo to the English band the Housemartins, who were impressed enough to invite the Proclaimers on their 1986 United Kingdom tour. The exposure of the tour won them a January 1987 appearance on the British pop music television programme The Tube on Channel Four; "Letter from America" peaked at number three in the UK Singles Chart, while the album This Is the Story went gold. The follow-up album Sunshine on Leith featured the singles "I'm Gonna Be (500 Miles)", which went to number one in Australia and New Zealand, and "I'm On My Way". They had a hit with their EP King of the Road, which reached number nine in the UK in 1990. "I'm Gonna Be (500 Miles)" belatedly peaked at number three in the US in 1993, after appearing in the movie Benny & Joon. After seven low-profile years, they released their comeback album Persevere in 2001. A stage musical entitled Sunshine on Leith, featuring their songs, was created in 2007 for Dundee Rep and adapted as a feature film in 2013 bearing the same title. They featured in VH1's 100 greatest one hit wonders, "I'm Gonna Be (500 Miles)" having been their only US hit single. The Reids are well-known supporters of Scottish independence and have, at various stages of their lives, been activists for the Scottish National Party, expressing such views during their promotional tour of Britain in March 2007. On 16 May 2006 the twins announced their participation in a campaign to free a fellow Scot, Kenny Richey, from his death row sentence in Ohio, United States, including an appearance at a charity concert. (In December 2007, Kenny Richey accepted a plea bargain, which led to his release from death row and return to Scotland on 9 January 2008.) Also, in March 2010 they participated with Billy Bragg in a show at the Electric Palace, Bridport, supporting Reprieve, a charity that seeks to end the use of the death penalty. 2007 "(I'm Gonna Be) 500 Miles"
^ "AllMusic – The Proclaimers – Biography". Retrieved 16 July 2018. ^ Dangelo, Joe. "Proclaimers Return With Persevere". MTV News. Retrieved 3 November 2018. ^ Brian Logan (8 February 2007). "Pop idols". The Guardian. Retrieved 8 February 2007. ^ a b c d e f g "Official Charts > Proclaimers". The Official UK Charts Company. Retrieved 21 March 2016. ^ a b c d e f "BPI > Certified Awards > Search results for 'Proclaimers' (from bpi.co.uk)". British Phonographic Industry. Retrieved 21 March 2016. Top 50 peaks: "australian-charts.com > The Proclaimers in Australian Charts". Hung Medien. Retrieved 24 September 2015. "Then I Met You": Scott, Gavin. "25 Years Ago This Week: June 4, 1989". chartbeat.blogspot.com.au. Retrieved 24 September 2015. ^ a b c d "charts.org.nz > The Proclaimers in New Zealand Charts". Hung Medien. Retrieved 21 March 2016. ^ Sexton, David (12 September 2013). "Sunshine on Leith – film review". London Evening Standard. ^ Pepper, Daile (10 June 2009). "B52s and the Proclaimers are on their way". Sydney Morning Herald. Retrieved 30 March 2017. ^ "100 Greatest One Hit Wonders". List. VH1. Archived from the original on 3 February 2014. ^ "The Simon Mayo Programme". BBC Radio Five Live. 28 March 2007. Archived from the original on 23 March 2007. ^ "Letter to America: Proclaimers join campaign to free death-row Scot". The Scotsman. 16 May 2006. ^ "Freed death row Scot arrives home". BBC News. 9 January 2008. Retrieved 30 March 2017. ^ "What's On – West Dorset – March 2010". West Bay. Retrieved 30 March 2017. ^ a b "austriancharts.at > The Proclaimers in der österreichischen Hitparade" (in German). Hung Medien. Retrieved 21 March 2016. 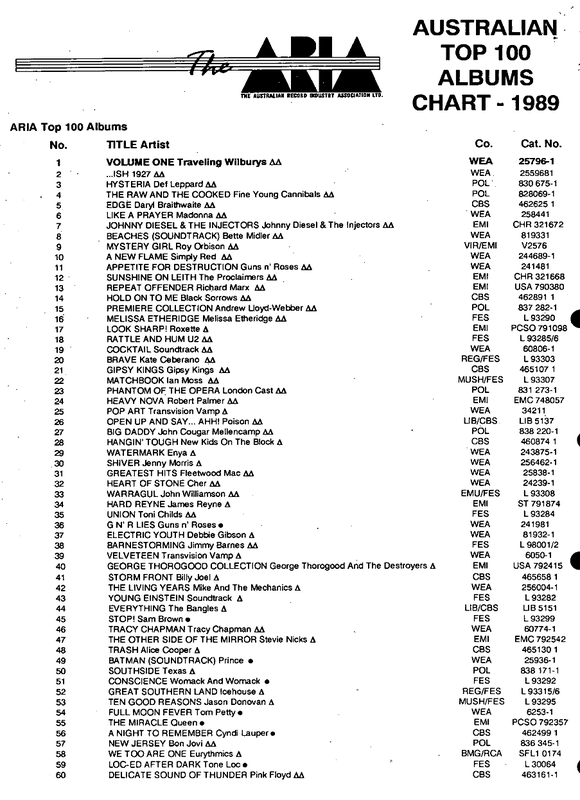 ^ "The ARIA Top 100 Albums Chart – 1989 (1–60) (from The ARIA Report Issue No. 1)". Imgur.com. Retrieved 26 May 2016. N.B. The triangle symbol indicates platinum certification. ^ "Ultratop (Flanders) > The Proclaimers in Ultratop Vlaanderen" (in Dutch). Hung Medien. Retrieved 21 March 2016. "Letter from America": "Offizielle Deutsche Charts > The Proclaimers – Letter from America (single)" (in German). GfK Entertainment. Retrieved 21 March 2016. "King of the Road": "Offizielle Deutsche Charts > The Proclaimers – King of the Road (single)" (in German). GfK Entertainment. Retrieved 21 March 2016. "I'm Gonna Be (500 Miles)": "Offizielle Deutsche Charts > The Proclaimers – I'm Gonna Be (500 Miles) (single)" (in German). GfK Entertainment. Retrieved 21 March 2016. 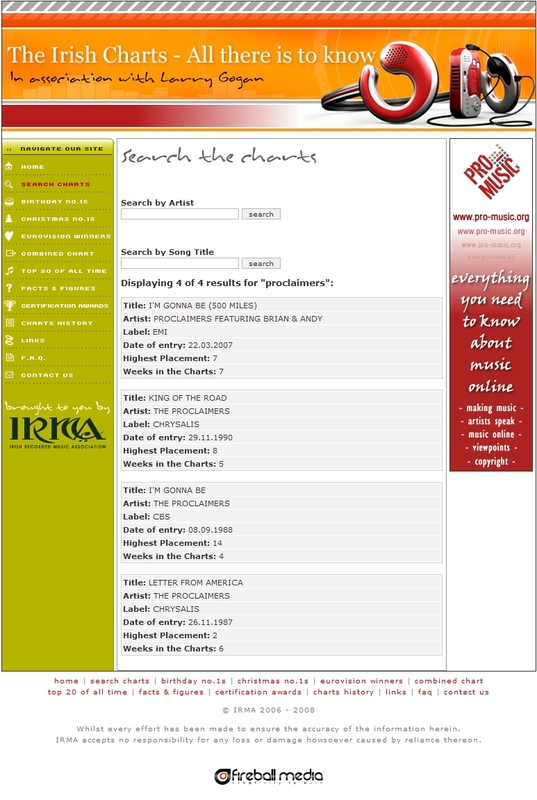 ^ "The Irish Charts – All there is to know > Search results for 'Proclaimers' (from irishcharts.ie)". Fireball Media. Retrieved 21 March 2016. ^ "dutchcharts.nl > The Proclaimers in Dutch Charts" (in Dutch). Hung Medien. Retrieved 21 March 2016.